Let’s be frank: Not all art is meant to be enjoyed sober. I’m not sure if The Man with the Iron Fists qualifies as art, but it is ridiculously sincere about its purpose in this world. And whenever I find this world’s purposes oblique, a strong drink will ease my confusion. Also, being blitzed is a reliable way to overlook flaws in story structure, direction, and acting in favor of yelling at the screen and making kung fu “Whoo-ah” noises. The Man with the Iron Fists is the directorial debut of RZA, famed member of the Wu-Tang Clan and regular collaborator with Quentin Tarantino. It is, I think, common knowledge that RZA is a Hong Kong action buff. So this film must be the culmination of the man’s wildest dreams. I will hand it to him, the film is indeed pretty wild. Before I discuss the plot I should mention that most traditional kung fu films have the barest of plots and what plots do exist are almost identical. Usually the movie is a journey by a novice to gain martial arts mastery, avenge a master or family member, or discover some secret technique. There isn’t much more to it than that. What constitutes the rest of the picture is fight choreography and cool stunts. In that sense, The Man with the Iron Fists is very true to its origins and what plot exists is there to move us to the next fight scene. I can dig that. Here’s the rub, though: RZA is not a 1970s Chinese kung fu movie director. I don’t mean this in any pejorative way, I’m just stating the facts. Just like Quentin Tarantino is not John Woo and Woody Allen is not Frederico Fellini. And such facts should never get in the way of one’s artistic vision. But, just like trying to make a twentieth century grindhouse film in the twenty-fist century, it is impossible to transfer the sensibilities of one era’s art form into the modern era without the two blending together. That’s the beautiful thing about progress and art in general. When you’re making a pastiche though, and that is what Iron Fists is, you will be fighting an uphill battle if you ever try to defend it on its own merits. On its own merits, The Man with the Iron Fists is silly. The action is garishly violent, and cartoonishly over the top. And that is why it makes a terrific drunk movie. It’s fun. It seems to take itself very seriously in places, especially whenever RZA is onscreen, but Russell Crowe is in this movie for some bizarre and wonderful reason and that helps. In fact almost all the actors in this film are having a rip-roaring good time. Except RZA. He is very, very serious. So, the movie’s about this place called Jungle Village, somewhere in time before the Opium Wars, and it is a madhouse of animal-themed kung fu tribes. The main plot concerns the Lions’ theft of the Emperor’s gold and the people they backstab and kill in order to get it. 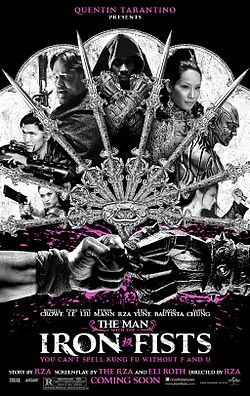 Also in the mix is a former slave blacksmith Buddhist monk played by RZA, a dangerous and mysterious drunken Englishman played by Russell Crowe, a sly and dangerous madame of the local brothel played by Lucy Liu, an avenging young warrior named the X Blade played by Rick Yune, and Brass Body, an unstoppable mercenary played by David Bautista. Do I really need to explain more of the plot than to say they all fight each other in interesting and violent ways? Well they do. And the fight scenes are great. RZA, unfortunately, sticks out like an iron thumb. His sleepy narration and sleepy acting are supposed to convey a stoicism of some sort but he is the lone and dour contrast to the colorful mayhem happening around him. Apparently, the first cut of this film was 4 hours long and RZA walked out of the editing room when he was forced to cut it down. Eventually he came back but was not fully satisfied with the final product. I can guess that much of the cut footage has to do with the blacksmith character’s backstory, which stops the film dead in its tracks in the latter half of the film. True, it does explain how RZA makes the iron fists work but its tone is completely out of sync with the rest of the picture. I’d be harder on this film but the inventiveness and genuine care on display after the emotionally bankrupt Evil Dead has me willing to give a pass to this first time director. Watch it with friends, watch it drunk, and don’t break the lampshade when everybody starts kung fu fighting. It’s an action packed dumb fun movie that pays tribute to the great martial arts films from every decade in existence. Not perfection, but worth a watch for fun. Good review. Thanks for the kudos, CMrok93!